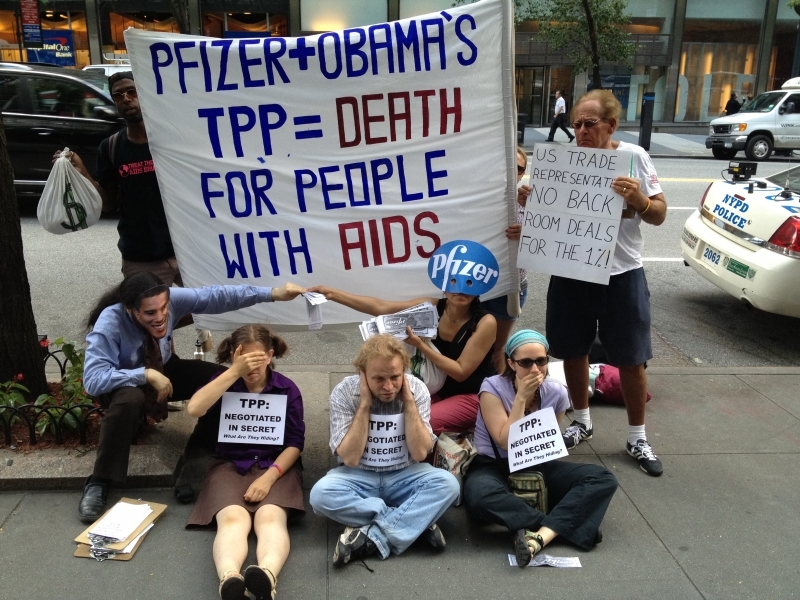 What Has TradeJustice New York Metro Been Up to Lately? TPP PROTESTS - LEESBURG, DC, AND NYC - In early September 2012, TradeJustice activists traveled to Leesburg, VA for the 14th round of TPP negotiations.� Day 1 was a Stakeholders' Event on September 9th, where nonprofits and industry groups were invited to set up information booths and give ten minute presentations.� TradeJustice member groups Global Justice for Animals and the Environment (GJAE) and Health Global Access Project set up booths expressing our concerns about TPP.� GJAE's Adam Weissman gave a presentation addressing concerns that TPP will contribute to the globalization of factory farm agriculture and increase the risk of livestock-borne infectious diseases like swine flu and avian influenza.� Ana Maria Quispe Piscoya spoke about how the Peru FTA has contributed to environmentally destructive projects that compromise public health in Peru.� Later that day, we participated in a rally against TPP.� In addition to bringing participants, signs, and banners, we worked with Citizens Trade Campaign and the Rainforest Action Network to coordinate media outreach for this event and protest activities during the next few days resulting including text and video coverage from Leesburg Today, an interview on the Thom Hartman show, and other coverage. 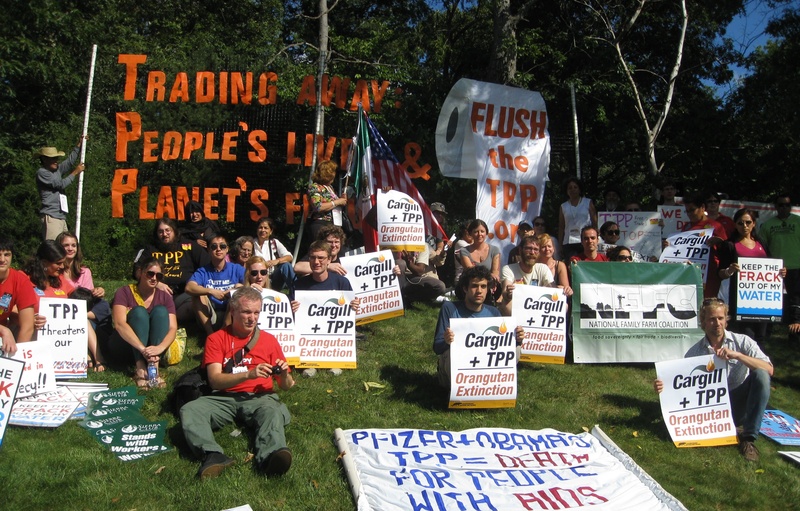 Prior to that, in December 2011, TradeJustice activists traveled to Washington, DC for a silent action at a Congressional hearing on TPP.� As the hearing came to an end, we stood in front of the room with shirts bearing messages including "Make Trade Work for the 99%" and "Don't Trade Away Our Lives. 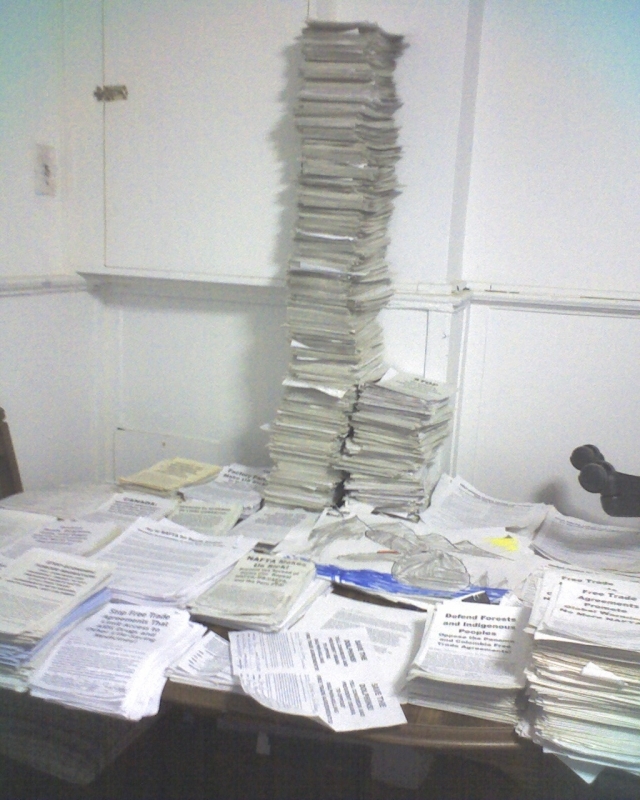 "� You can read more about this action and watch a video at http://tradejustice.net/?page=TPPHearing1211. Q'ORIANKA KILCHER PETITION DELIVERY & LEGAL SUPPORT - On September 13th, during the Leesburg TPP meeting, we arranged for actress and activist Q'orianka Kilcher, star of films including The New World and Princess Kaiulani, to fly in from Los Angeles for a high profile delivery of petitions signed by over 360,000 people concerned about TPP's attack on our environment, our jobs, and our health.� As Q'orianka was leaving the site of the negotiations, she observed police harassing other anti-TPP activists and tried to document the incident with her cell phone camera.� For this, police arrested her and are pressing trumped up trespass charges to punish her for documenting their misconduct.� Thankfully, the ACLU of Virginia responded to our request for assistance and referred her case to a firm that is going to represent Q'orianka on a pro bono basis. 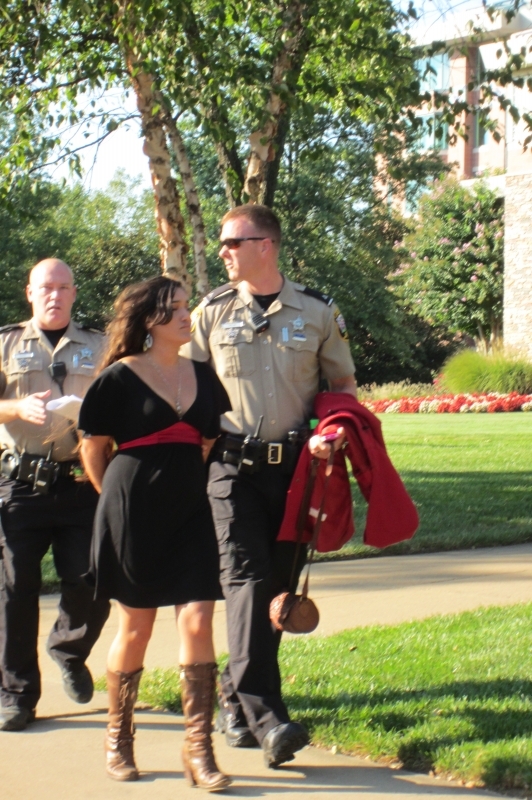 You can learn more about Q'orianka's petition deliver,� arrest, and the media attention the incident generate at http://tradejustice.net/?page=QoriankaTPP. We've established a fund to cover Q'orianka's travel expenses to court and other outstanding costs from the Leesburg protests. You contribute at http://tradejustice.net/tppfund. TEACH-INS AND SPEAKING OPPORTUNITIES � Immediately after returning from Leesburg, we held an educational presentation as part of the one year anniversary of Occupy Wall Street. 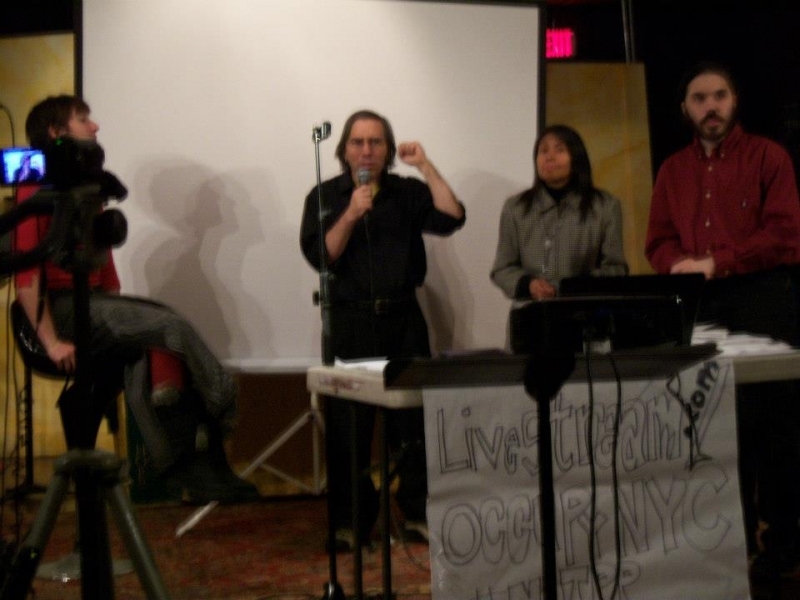 We held many similar presentations throughout late 2011 and 2012 at events including teach-ins at Washington Square and West Park Presbyterian Church, three teach-ins in Zuccotti Park, three workshops at the Brooklyn Food Conference, and a panel discussion at the Brooklyn Peace Fair.� We were also invited to speak on a panel on social movements at the Winning the Crisis academic conference at New York University, at a live performance to a capacity of crowd of 400 by the hosts of Naneun Ggomsuda, South Korea's most popular podcast, at a Bergen County (NJ) Greens forum and at a Grammercy-Stuyvestant Independent Democrats meeting. �Our last two events of the year were held on October 26th at the Community Church of New York � Unitarian Universalist and on November 27th at the Metropolitan Community Church of New York, organized in collaboration with the Occupy Wall Street Environmental Solidarity Working Group. The earlier event focused on TPP's threat to the environment, while the latter event focused on a wider range of subjects, including how TPP will limit access to lifesaving generic drugs, undermine bans on genetically modified foods, and threaten our ability to ban hydrofracking and other environmentally hazardous practices.� The later event ended with a series of lively breakout groups, where we began to plan our strategies for fighting TPP in the coming year. We've been collecting and editing the video footage from the two events and will be releasing a videos of the events on Youtube shortly. HOLDING LEGISLATORS ACCOUNTABLE - On December 9th, 2012, we braved heavy rain to hold a small but persistent protest during Congressman Joseph Crowley's holiday party.� Crowley, chair of the pro-corporate New Democrats Coalition, was recently elevated to the 5th most powerful position in the House Democratic hierarchy.� As a member of Trade subcommittee of the House Ways and Means Committee, Crowley has been a vocal supporter of NAFTA-style free trade agreements and has voted for every free trade agreement to go to Congress since 2006.� Among the party attendees was New York Senator Chuck Schumer.� Senator Schumer took our literature and we had a brief but polite exchange where we asked him to co-sponsor Senator Brown's 21st Century Trade Agreements and Market Access Act.� He said that he'd look at it that he'd been with Senator Brown earlier that evening.� Brown had held an event in NYC the same day, and a TradeJustice activist was on hand to thank Brown for his support for fair and responsible trade policy and to give attendees fliers that asked them to encourage our Senators to support Brown's bill. The Crowley protest was the most recent in a series of demonstrations we've been holding since October 12th, 2011, when the House of Representatives infamously voted to pass the Colombia, Panama, and South Korea Free Trade Agreements. In that time, we've held protests targeting Congressmembers Carolyn Maloney, Charlie Rangel, Michael Grimm, Bob Turner, and of course Joe Crowley, all of whom voted for two or more of these job-killing, anti-environmental trade deals, and President Obama, responsible for the passage of the Panama, Colombia, and� South Korea Free Trade Agreements and for the current push for TPP.� Undaunted by summer days in the high nineties, rain, freezing cold, and heavy snowstorms, we've been at their offices, their fundraisers, their debates, their birthday celebrations, their swearing-in ceremonies, and their town hall meetings � sometimes with large groups of protesters and elaborate street theater and other times with just a handful of picketers with sandwich boards and leaflets.� We protested Rep. Crowley alone on six separate occasions. 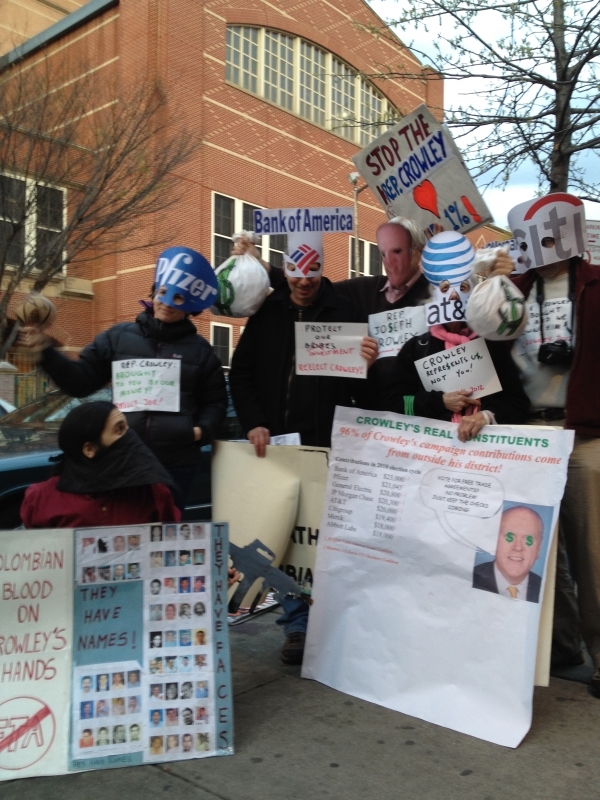 No effort in our ten year history has garnered more media attention than our legislator accountability campaign for the October 12th vote � helping us send the message to these corporate crony Congressmembers that we haven't forgotten how they sold old � and we won't let their constituents forget, either. CALL-IN DAYS AND ACTION ALERTS - As the 112th Congress was coming to a close, we sent an action alert to our supporters urging them to� call their Senators, asking them to cosponsor Senator Sherrod Brown's 21st Century Trade Agreements and Market Access Act, which illustrated a fairer and more responsible model for international trade. Throughout 2012, we passed on action alerts on trade justice issues to our supporters from allied groups like Citizens Trade Campaign, Public Citizen's Global Trade Watch, Witness for Peace, The Sierra Club, Avaaz, and the Rainforest Action Network. 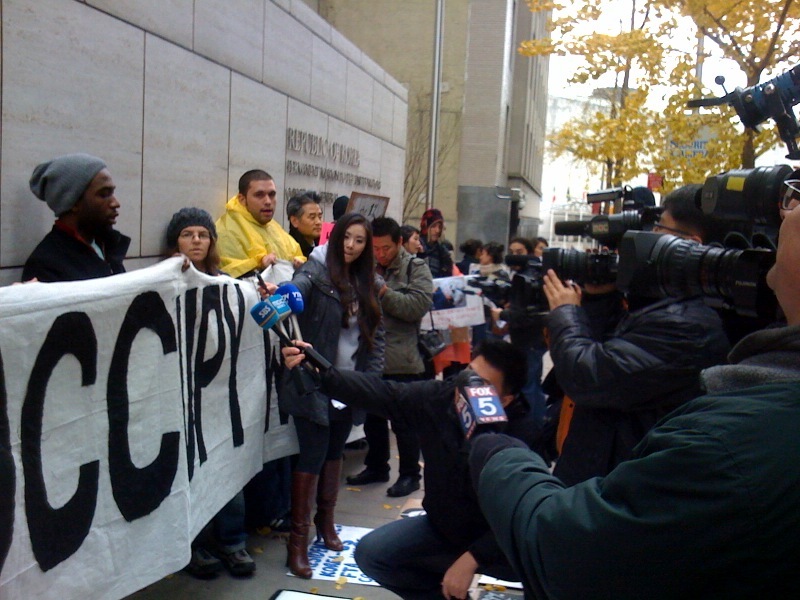 MEDIA COVERAGE AND INTERVIEWS - In late 2011 and 2012, TradeJustice received the strongest media coverage in our coalition's history during the media's brief but intense period of fascination with Occupy Wall Street.� Our actions were covered in countries though the world.� Our disruption of Bob Turner's inauguration was received massive media coverage� - covered in hundreds of newspapers, radio shows, tv news programs in the US and beyond - including a front page story in the New York Post, and stayed in the news for days.�� In a Good Day New York interview on Fox 5, Charlie Rangel was forced to answer questions about why Occupy protesters were protesting his trade voting record at his office at the same time he was trying to frame himself as an OWS supporter.� Media coverage of our Korean consulate demonstration at the Korean Consulate was heavily covered by Korean media and featured on Democracy Now!, which also interviewed three speakers at our first teach-in at Zuccotti Park.�� The Daily News and and TV news station New York 1 covered our demonstration at Carolyn Maloney's office on the day of the Colombia, Panama, and South Korea Free Trade votes.� The Staten Island Advance, the island's primary newspaper, featured our Day of the Dead demonstration against Michael Grimm on their front page and two articles about the protest and a photo gallery on their website.� In addition to news coverage of our protests, TradeJustice activists were interviewed on WBAI radio's Ecologic, Asia Pacific Forum, and Evening News and the Progressive Radio Network's American Jobs Alliance and Pure Imagination shows - twice on the latter program (2/3/12 and 8/17/12). PETITION CARDS AND LOBBY VISITS - In October 2012, TradeJustice brought 25,000 signed cards to Washington, DC in oppositon to the South Korea, Panama, and Colombia Free Trade Agreements and delivered them to Congressional offices with the assistance of our allies at Public Citizen's Global Trade Watch and the Washington Office on Latin America.� The delivery was the culmination of years of work doing outreach at film screenings, rallies, conferences, marches, and other events and months of work preparing the cards for delivery.� We also presented the cards to legislators and their staff in a series of lobby visits in their district offices, where constituents and representatives of diverse community groups urged legislators to stand up for the 99% by voting against the 1%'s FTAs.� We were especially gratified that two of the legislators we lobbied, Represetatives Ed Towns and Yvette Clark, were among the five New York City representatives who voted against all three FTAs, despite having voted for FTAs in the past. OUTREACH AT MOVIE SCREENINGS AND OTHER EVENTS - Throughout 2012, we fliered, petitioned, and ran information booths about TPP at many events, including the LGBT Pride Parade; The We Can End AIDS March in Washington, DC; anti-fracking events in Albany and New York City; the annual May Day march; the Brooklyn Peace Fair; the Brooklyn Food Conference; the Marti Kheel Ecofeminist Conference; and many others.� We also marched as an anti-TPP contingent at many of these events.� In January 2013, we petitioned and flyered at screenings of Promised Land, a new film on hydrofracking, educating moviegoers� about how NAFTA and TPP threaten our ability to ban fracking.� You can view the form letter we asked moviegoers to sign at http://tradejustice.net/fracklet.� You can view the handout we distributed at http://tradejustice.net/frackfli. TPP PHOTO CONTEST - At the request of our allies at Public Citizen's Global Trade Watch, we participated in a national TPP photo contest, taking photos with anti-TPP signs in front of prominent New York City landmarks and offices of major media outlets.� Sites we choose included Times Square, the New York Public Library main branch, in front of the office of the New York Daily News, Wall Street, and by the Gandhi statue in Union Square. JOIN THE FIGHT FOR TRADE JUSTICE! 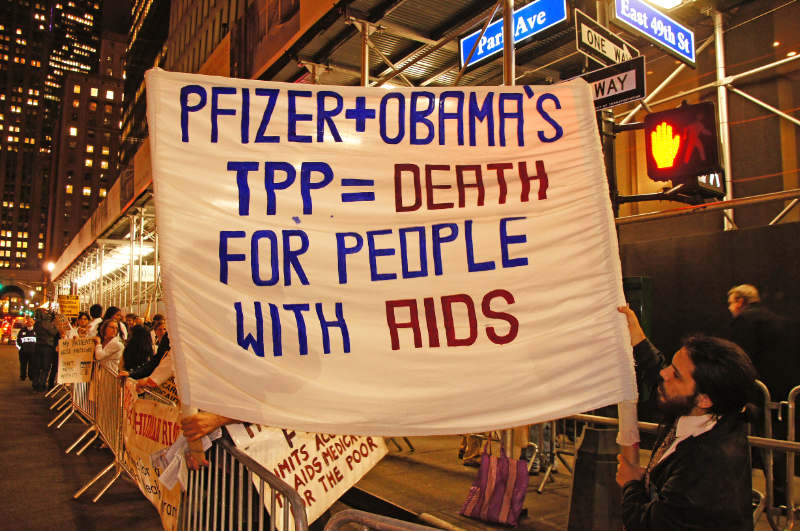 You can help TradeJustice New York Metro continue our efforts to oppose free trade agreements that endanger our jobs, our environment, and our health by volunteering your time, attending our events, and by becoming a TradeJustice donor. To become a volunteer or to stay abreast of our activities and the issues we work on by joining our email lists, fill out the questionnaire at http://tradejustice.net/form.